Threadless Holiday Sale Pt. 1: $12 Tees! The time has come for me to announce the big winner! I would like to thank everyone who participated in the Loving This Tee contest for a free “Panda” t-shirt from Rotten Thread! As I mentioned in the contest post, I did not select a random winner, but instead let someone else choose the winning pair of names. My friend had quite a difficult time narrowing the list down to 10 pairs of names, and it was even more difficult narrowing it down to just one. So who’s the winner? Let’s first see the names that were assigned to these two pandas! And there you have it. 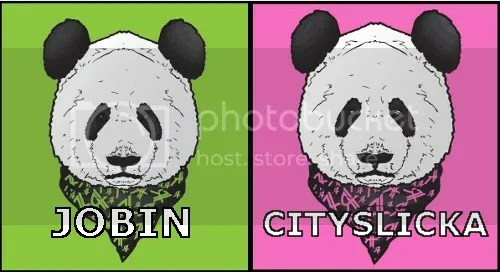 The pandas’ names are Jobin and Cityslicka! Congratulations to Cory for winning a “Panda” tee from Rotten Thread! I will be e-mailing you shortly about how to claim your free t-shirt. For those who did not win this time, I have enjoyed reading all of your submissions and I thank you again for joining in on the panda-naming fun! You are all winners in my book. I hope to see all of you in the next Loving This Tee competition! For up-to-date information on new posts and contests, follow the Loving This Tee Twitter! There, you will also find many great deals and information from many different t-shirt companies. 2 Responses to "Rotten Thread Contest Winner"
Congrats Cory!!! We’ll get that t-shirt out to you right away!